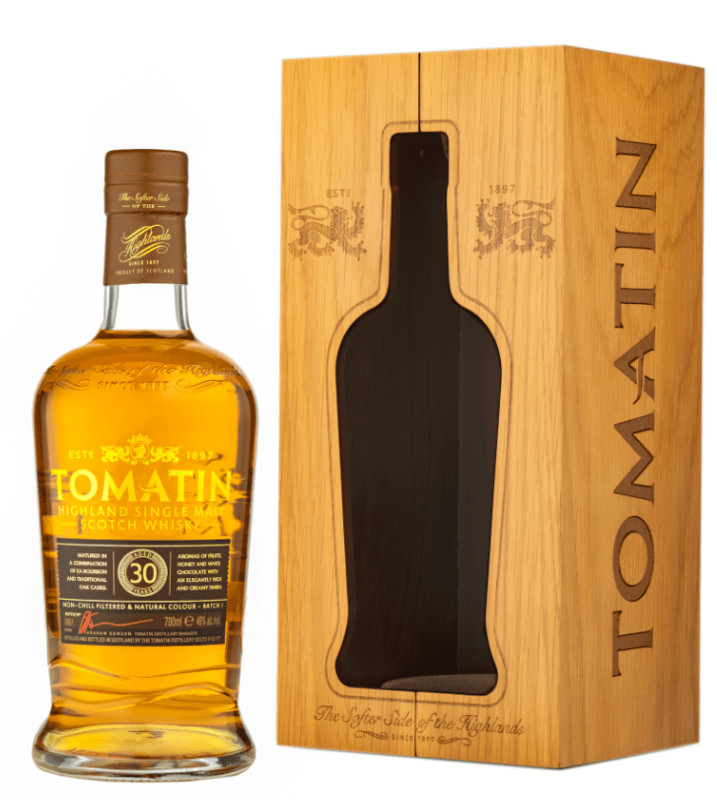 Tomatin has announced a release of this 30-year-old whisky only a few weeks back (end of September), Retailing at £300, the expression is a premium batch release decanted into individually numbered bottles, with only 900 available in the UK. The whisky was finished in first fill ex-Bourbon barrels, is presented in a premium oak box and is accompanied by a carrying case and seems to address the ultra premium market, as opposed to previous releases which did not go to length to present the whisky in such a luxurious way (adding to the price of course). Palate: The palate is also rounded and sweet, with even more tropical fruit (pineapple, mango), with a nice touch of ginger powder, more chocolate, and nice malty touch as well, with time more notes of apple peel and nutmeg are revealed, as well as creamy vanilla and a hint of green banana. Finish: The finish is of medium length, with the soft fruit, vanilla and wood going on for some time, quite creamy and rich. Fans of Tomatin would certainly love this expressions, It’s a fitting replacement for the very good 1988 vintage (reviewed here long ago). If you’re after a 30 year of a wood driven expression, you might want to reconsider, since although there’s plenty of tropical fruit goddess in here, there’s not a lot of old kind of wood , if that’s what you’re after. At any rate, this is a classy whisky, with enough complexity and finesse to please any serious whisky lover. 300 quid is not cheap, but if you look at other 30-year-old OBs, the pricing is not bad… At any rate, good stuff from Tomatin. A little more wood (and some higher ABV and this would be in the 90’s for sure.